Who said juicy and delicious burgers can’t be vegetarian? At the newly opened Cut + Grind at Kings Cross the veggie and vegan burgers are just as tasty as their famous beef patties. And the best part? 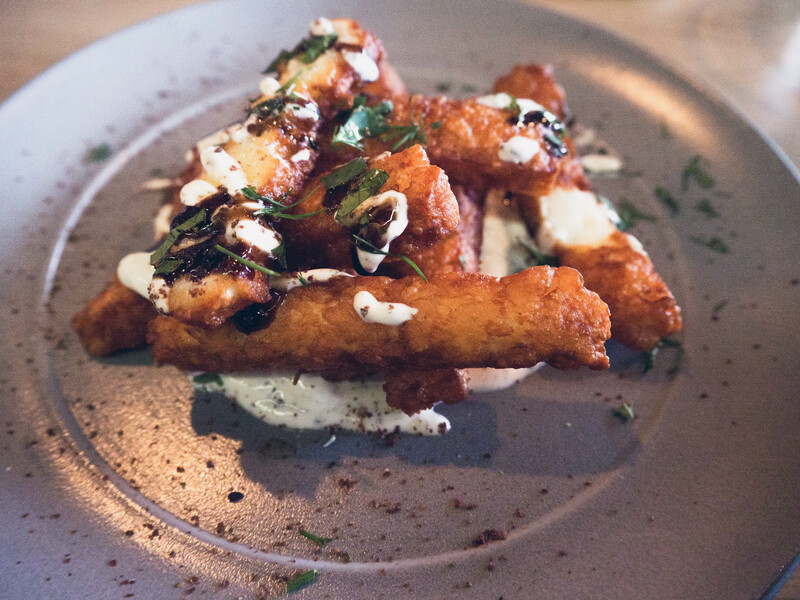 The yummy side dishes including halloumi fries, feta salad, sweet potato fries and chargrilled broccoli with garlic anchovy and chilli butter which will satisfy any discerning foodie (and have them back for more…). Located in The Urbanest Building in Kings Cross this newly opened classic burger joint with a vegetarian twist offers a relaxed and cool vibe. The on-site ground burger restaurant is the perfect weekend hangout where a hearty lunch can be washed down with premium organic Italian wine and prosecco or a great selection of Belgian and German brews including the cherry-flavoured Timmerman’s Kriek and yeast-free Erdinger Weißbier. 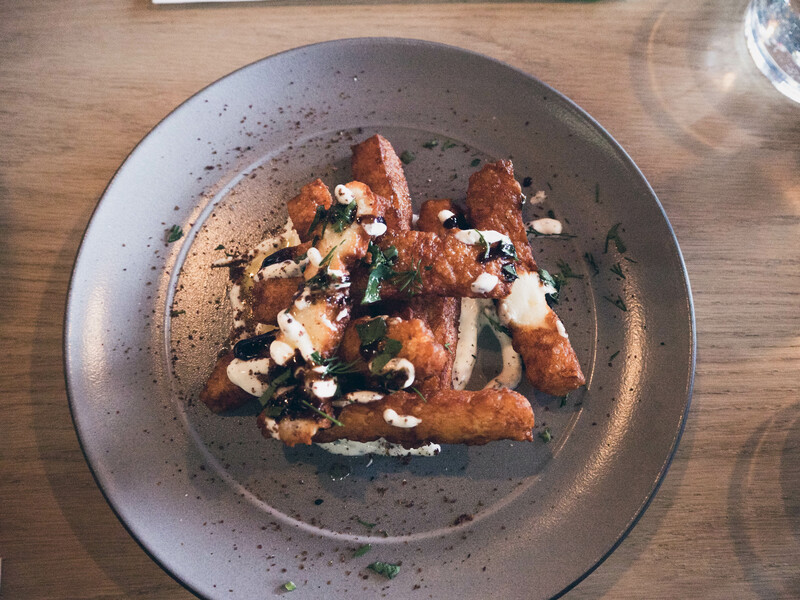 Head Chef Sammy Aykak has created a fresh and innovative menu including vegetarian as well as vegan burgers with unique flavour profiles in addition to the classic beef burgers. The vegetarian burger comes with halloumi, red pepper, hummus, rocket, tzatziki and house pickles whilst the vegan option comes with miso glazed aubergine, sesame slaw, sweet pickles and home-made spiced tomato sauce. Both are incredibly flavoursome, fresh and healthy. There is a gret selection of sides including the chargrilled broccoli with garlic anchovy and chilli butter which is one of the best dishes on the menu. 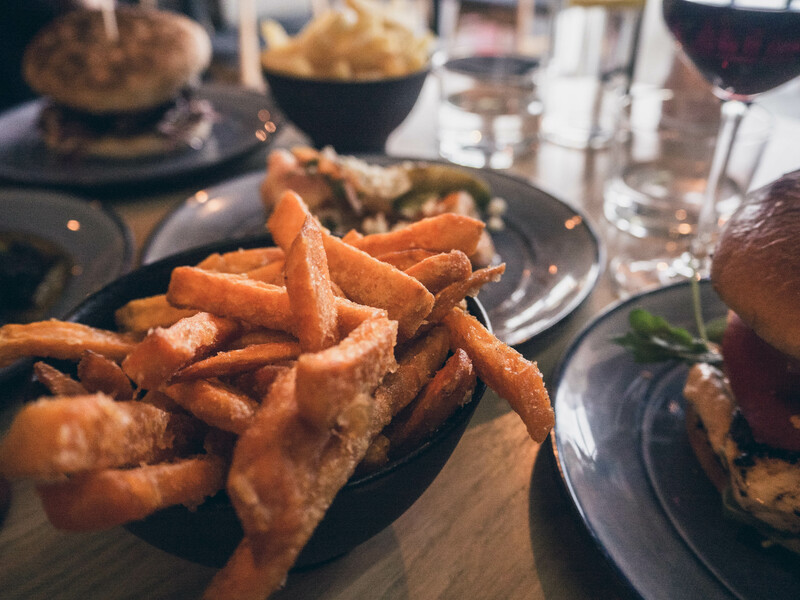 The sweet potato fries are cooked to perfection and so are the traditional fries (which can be cooked in vegetable oil on request). Traditional burger fans will not be disappointed with the ‘Juicy’ or ‘Skinny’ burgers made from meat stored in a custom-built display fridge and not grinded until they are ready to be cooked. This is the secret to the incredible beef patties which are also made using fully traceable 100% British beef from award-winning butcher, Turner & George. If the delicious burgers with all the trimmings haven’t filled you up and there is still room for puds you are, again, in for a real treat. The warm caramelised apple tart with salted caramel and ice cream is fantastic and even better when enjoyed together with the triple certified espresso coffee. 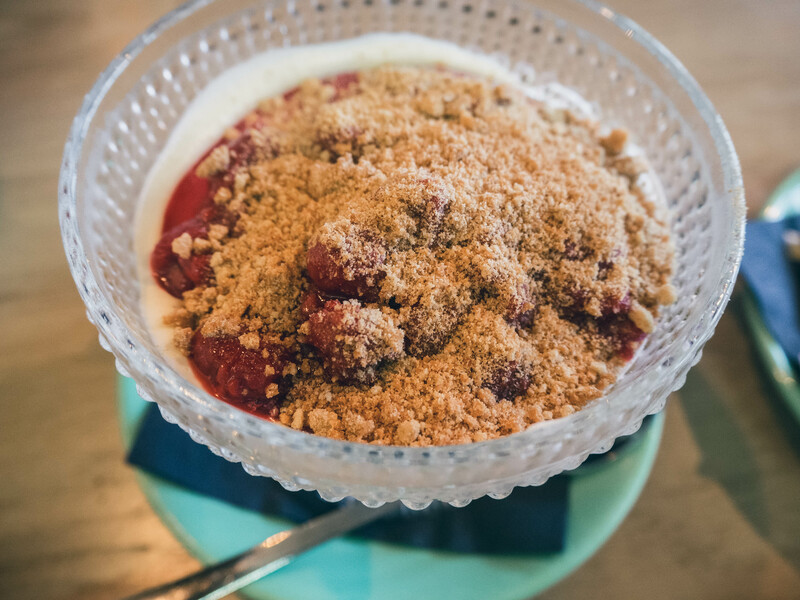 Other options include sticky toffee pudding, sundaes, brownies and an upside-down cheesecake served with raspberries. Cut + Grind is not just offering lunch, if you are looking for a new breakfast spot this hidden gem is also offering a great breakfast menu including Shakshouka eggs, breakfast burgers, bagels and English muffins. The service is great, the atmosphere friendly, however, it is the food that is the real winner here!